Now don't be daft. The A1(M) is there. Yes, it is. You may have noticed, though, it's in lots of bits. Well, of course it is. It's lots of bypasses, right? Absolutely, yes. But that wasn't necessarily meant to be the case - at least not at one point, anyway! I'll humour you. I suppose. I'll just get on with it then, shall I? The real problem with the A1 is generally one of its own making. It's really been a case of "almost good enough" during the periods of roadbuilding, and so it's never really seen the kind of road improvements seen elsewhere. It was really not helped by the M1 being not far to the west with a route that was better located to take traffic to and from the large cities in the area, such as Sheffield, Leeds, Leicester, Derby and Nottingham; whilst the A1 passes smaller places like Doncaster and Peterborough. In the 1950s, some sections of the A1 were pretty good. Therefore (with quite a lot of criticism, it has to be said), the Government decided upon a piecemeal approach to upgrading the A1. Some bypasses were to be motorway, some to be all-purpose. Other sections were considered to be of an acceptable standard. So, the A1(M) as we know it today was born, with relatively short sections of the old road being upgraded to motorway. The Doncaster Bypass was the first section opened in 1961, followed by the Stevenage Bypass in 1962 and the Darlington Bypass in 1965. However, the other A1 bypasses that didn't make it to motorway standards in the 1960s were almost as interesting as those that did. There was quite a bit of faffing in the Ministry about exactly which sections would end up as motorways. This lead to one or two headaches for the mapmakers of the time - it's not uncommon to find maps of the period with non-motorway sections such as the Grantham Bypass marked as A1(M). There's also the piece of trivia where the Stamford Bypass was one of the first locations in the country where modern signage was tested. Good eh? This messing about was, in some places, quite ridiculous. The Doncaster Bypass's southern terminal was at a normal, flat roundabout where it meets the Blyth Bypass. The two roads were constructed together as part of the same contract, are of exactly the same standards (with hard shoulders and the like), but the Doncaster Bypass is A1(M), and the Blyth Bypass is just plain A1, all for the sake of a single flyover. Things didn't stop there. Throughout the late 1960s and 1970s, only certain sections were upgraded to A1(M). Other improvements, yes, you've guessed it, were simply to A1 standards. Come the 1980s, and just one improvement along the A1 was to motorway standards - the section that included the Hatfield Tunnel in 1986. Even Roads for Prosperity in 1989 only saw some improvements to the A1, with just two sections being planned to be upgraded to A1(M): between Letchworth and the A14 near Huntingdon, and between the Doncaster Bypass and the then-planned M1 extension at Hook Moor in Yorkshire. Otherwise, it was general widenings and improvements between Huntingdon and Stamford. As well as that, it promised a "comprehensive review of the route including investigation of the possibility of full motorway status from London to Tyneside". Having said that, on 3 July 1990, the then-Transport Secretary, Cecil Parkinson announced that, in future, all improvements on the A1 between M25 and Tyneside would be "to motorway standards", and that eventually that the whole lot would become motorway. Contrary to belief in certain quarters, there was no announcement regarding any change of number for A1(M) - certainly not to M10, which appears to be the favourite myth. However, it appears from internal DfT documentation that a number was reserved for the route and perhaps surprisingly, it is M100. A fast start was made on certain sections - most notably that between the A14 and Peterborough, but this wasn't to last. The A1(M) upgrades survived the 1993 cuts, but not the incoming government's 1997 almost total destruction of the roads programme. Well, not entirely, anyway. The removal of the A1(M) upgrades from the programme left us with a massively overblown new section near Peterborough, which is four lanes wide rather than the two lanes to either side, though Yorkshire seems to have declared a kind of semi-independence where the A1 is concerned, and slowly, slowly, piece by piece the A1 is being upgraded to A1(M) throughout the county, though bizarrely there's still a gap of a few miles between the Doncaster Bypass and just south of the M62. Elsewhere, the rest of A1 is getting cheap and nasty junction improvements. 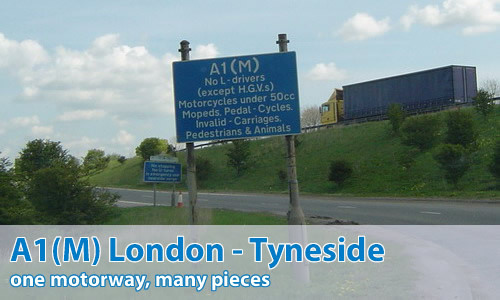 In short, the concept of the A1 being upgraded to motorway between London and Gateshead is dead, although with the help of the M1, Tyneside will at last be linked to the rest of the English motorway network sometime around 2018.